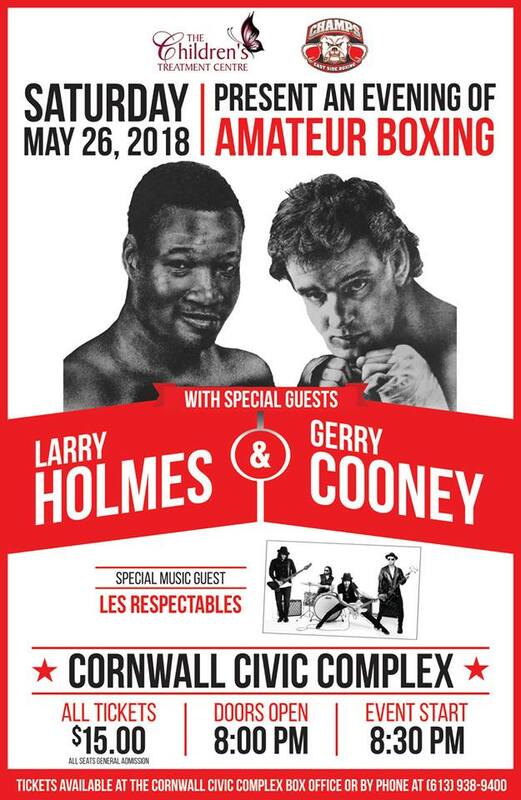 The Children’s Treatment Centre presents a fundraiser evening of Amateur Boxing on May 26 with special guests Larry Holmes and Gerry Cooney. There will also be a special musical guest: Les Respectables. Doors open at 8:00 pm, and the event begins at 8:30 pm at the Cornwall Civic Complex. To buy tickets, call the Cornwall Civic Complex Box Office at (613)-938-9400 or visit the box office in person at 100 Water St. East. For more ticket information, contact the Children’s Treatment Centre at 613-933-4400.